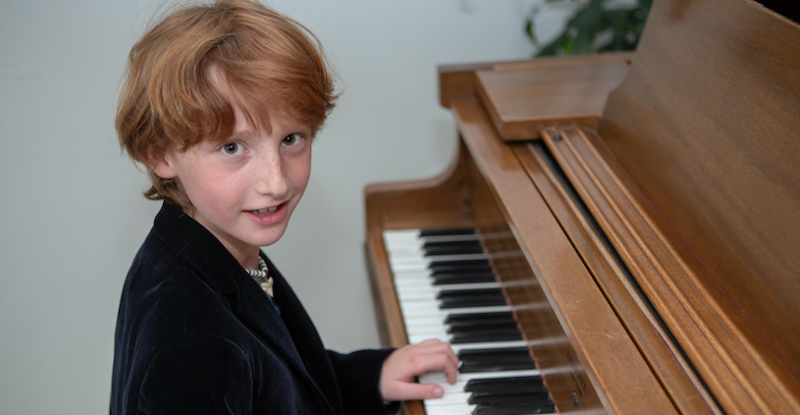 In his first journalistic endeavor, Spencer Matorin, a fourth grade student at Ashley Falls Elementary School in the Del Mar Union School District; the son of Dr. Robert Matorin and photojournalist Dana Greene; and the grandson of former Heritage Newspaper Co-Publisher & Columnist, Norman Greene; and big brother to William; interviewed one of the world’s most talented pianist-actors of our time, Hershey Felder. Spencer Matorin: What inspired you to play piano? Hershey Felder: When I was three years old, I was constantly banging on the piano and someone told my parents that instead of all that noise, I should be taking lessons. I was about 6 years old when I really started to play the piano. In my 20’s I knew that I wanted to be an actor and a musician. Music is my way of storytelling. SM: Besides classical music what is your favorite type of music? HF: It is important to play all types of music. When I am not working, I always try to learn new music. I tend to listen to classical music the most. When developing a new show, I try to listen to the many ways different performers play the same composition. SM: How do you learn about the person you are portraying? HF: First of all, I study [their] music. That is very important. Then after that, I learn about the composer [as a person]. I try as much as possible to and understand the composer’s character, where the music comes from so I have context as to how he actually composed this music. I think it is so very important to understand the character of the man. But it takes a long time to learn these things. SM: Sometimes I get nervous before a piano recital. Hershey, how do you prepare for your shows? HF: I think you just have to know that being nervous is part of what happens and that sometimes you just get nervous and you just have to calm down and take a deep breath and not be nervous. I know it’s easier to say then to do it, but that’s really the way it works. You have to try and not be nervous. And I think that’s the best way to work. SM: I am excited to see your upcoming show about Beethoven. How did you prepare for the role as Beethoven the man? HF: Well by reading so much about him and reading his own letters and that made a big difference. SM: Did you go to the Beethoven house to read those letters? HF: I did. I went to all the places he lived. I went to Germany and I went to Vienna, mostly Vienna because that’s where he lived most of his life. SM: What surprised you about Beethoven’s life? HF: His life was more difficult than I could have ever imagined, you know. I mean I knew the basics of his life, but he had a very hard life because he was a lonely man. It is amazing for a lonely man to create such beautiful music and it was very touching to understand how difficult it was for him personally and how lonely he was, yet at the same time, he created all this beautiful music. SM: Sometimes I become impatient with myself when I am having a difficult time learning a new piece. What advice do you have for young people learning to play piano? HF: Patience is a virtue. Keep working at it…you will surprise yourself that one day, suddenly all the work will pay off, and all of it becomes much easier. Then, you remember that, as you engage in your next study and find the same impatience.